A Chinese firm called Howchip, owned by Unibest, has launched an Android Nougat Development Platform. The ExSOM-8895 DVK showcases Samsung’s Exynos 8895, an octa-core SoC that is available on EMEA-bound versions models of the primarily Snapdragon 835 based Galaxy S8 phone. 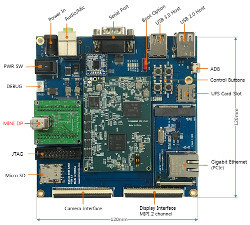 The 120 x 120mm Nano-ITX form-factor board integrates an unnamed 70 x 50mm compute module that houses the Exynos 8895 and runs Android 7.0 with Linux kernel 4.4.13.